So you know how we normally hang out here on Mondays, right? Well, this Monday, I invite you to join me somewhere else. I was asked to contribute to a series called 30 Days of Raising Boys, and I don’t want you all to miss it. Whether you’re raising boys, girls, or both, motherhood is messy and wonderful and miserable and awesome all in a great day’s work. So do yourself some good today and read words that prove you aren’t the only one. You can find my post for the series here: Raising Boys Who Redefine Competition. Let me just tell you something about these words I wrote. Luke played in a baseball tournament over this past weekend. And these words came back to punch me in the gut. Not because I needed to whip them out in my parenting arsenal…but because I needed to preach them to myself. My most favorite thing is that if you sign up before the end of October, you get the Big Book of Scriptures to Pray Over Your Children for free. I know a little bit about insecurity. Actually, that’s an understatement because if there was such thing as an Insecurity Expert, I’ve basically earned a Ph.D. or something. The good news for you is, I’m real-life proof that just because you live steeped in insecurity today, does not mean you’re doomed to that life forever. Ideally I could tell you that my own path from insecurity to freedom was instantaneous. In fact, it’s been an ongoing growth process where those “less than” feelings have been shed layer by layer. –Insecurity walks into a room, and a familiar wave of “not belonging” begins to fill up your gut. –Insecurity reminds you that you don’t fit there. —Insecurity convinces you that every eye is on you, deftly picking apart all your inadequate pieces. —Insecurity reads between the lines of every word spoken, and hyper-focuses on how others interact with you (their tone of voice, body language, etc.). You’ll use this info later in your obsessive mental replay. –Insecurity takes the words of others and twists them to confirm that you are wrong, good for nothing, and “less than” everyone around you. –Insecurity tells you that you shouldn’t get involved at church since you probably don’t have anything special to offer. They seem to have it handled anyway. –Insecurity keeps you from applying for that job you feel like you were made for…because surely someone more qualified will get the offer. When you carry insecurity in your heart, you carry insecurity with you into every room, every situation. Is this really how Jesus people are meant to live? Didn’t Jesus say that we’re worth a whole lot? Didn’t he prove we’re worth a lot more than human opinions when he died for us? I mean, that’s kind of a big deal. So how do we live like that’s really true? Victory over insecurity requires that you have some face time with God. Because God’s view of you is reality. But if you don’t know what He says…then how can you live out the truth? (1) Rather than nurse your irrational feelings in the face of insecurity, lean into Jesus and ask him to show you what truth looks like in your current situation. You are loved and accepted by the One who matters most. (Ephesians 1:5-7, Ephesians 2:4-5). God gives you strength and dignity (Proverbs 31:25), therefore you are valuable and worthy of respect. 2) Go ahead and channel REO Speedwagon. Because you really can’t fight these feelings anymore in your own strength. When the self-obsessed drivel works up a chatter for your attention, ask God what it’s all about. He can shine light on the real source and help you deal with it in truth. (3) Think “Drop It Like It’s Hot” when perceived slights creep into your insecurity loop. Don’t even give those thoughts a chance to make one full spin around the mental track. Because over-analysis is sort of what got you here in the first place. It all sounds pretty easy tucked into neat bullet points, but this is one of the hardest battles I’ve ever faced. Time and time again we need to stick our nose in scripture and beg God to give us His perspective so that we don’t just fold up into our own shaky self esteem. But watch out, world. Because when we apply God’s truth to our insecurity, we will be unstoppable. And friend, that’s exactly what God wants for you. Will you believe it or not? Exhibit B: Drop It Like It’s Hot. I don’t even know, y’all. I’m blaming it on hormones or Jesus. Because seriously. I don’t know about you, but some days I just wake up at the bottom of an Insecurity Pit. And it’s on those days that I have to preach the gospel to myself, or I will otherwise spend the day as a pit-dweller, which pretty much means that I’ll spend the day measuring myself against others, and reminding myself of the 58 reasons that I’m ill-equipped and under-qualified. 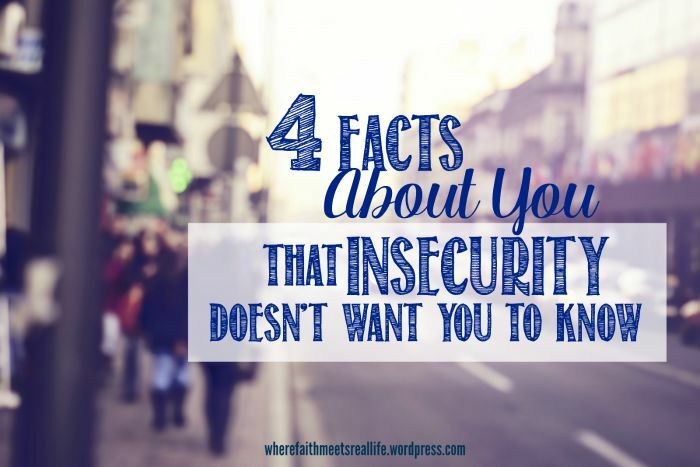 Insecurity is a bold-faced lie that creeps into our life from all angles. We have insecurities about everything from our bra size, to dress size, to the size of our homes. 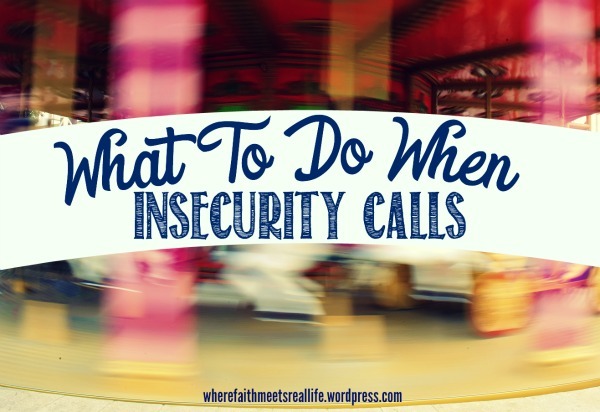 We wear insecurity on our shoulders as we muddle through friendship issues, mother-in-law drama, and parenting fails; and insecurity is the filter through which we interpret every conversation. Insecurity is a pit-dwelling trap, and nobody has time for that. But it’s not like we text Insecurity and invite her over for coffee and muffins, nor do we go looking for a pit to jump into. Which means something tricks us into that pit, and we need to figure out how to avoid it next time. 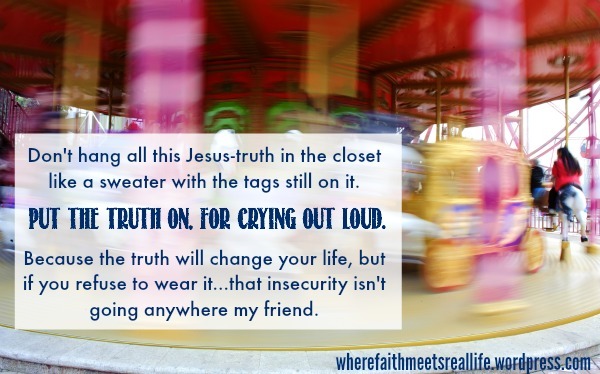 Here’s the deal: if the way you see yourself is rooted in insecurity, then your view is vastly different from God’s. And the key to avoiding the pit is to live based on how God sees you. (1) You have been adopted as a CHILD OF GOD. (John 1:12; 1 John 3: 1-2). I know. How clever of me to tell you what your 2nd grade Sunday school teacher told you. But actually, when you sink your mind into the implications of what “being God’s child” really means, you will discover that true faith isn’t grown in a cotton candy patch. Throughout scripture, God’s people are the underdogs who have no hope of winning and every reason to fail. They are the Least Likely and Most Ordinary who dare to believe God is who He says He is. Their lives aren’t defined by their trials or successes, but they have a deep sense of security in the middle of hard and painful and unfair. (2) You are ACCEPTED in Christ (Romans 15:7, Colossians 2:9-10). We can list every reason why God shouldn’t accept us. But I forget that nothing I do surprises him…and I start thinking how disappointed He must be. But, hello, God knows more about us than we know about ourselves…flaws and all. And He accepts us anyway. This means that even when life throw us for a loop, or when relationships fail us and disappoint us, we can still rejoice in Christ’s complete acceptance of us. Nonetheless, knowing this will change your life: God purposed you to live in this time, in this place, in this generation. And He custom-made you with skills, strengths, and gifts so that He can uniquely impact others through YOU. (4) You are a CITIZEN OF A HEAVENLY KINGDOM (Philippians 3:20). I know, I know. You aren’t dead yet, so what does your eternal address have to do with it? Actually, heaven has everything to do with this very moment. Jesus-people have been born into the Kingdom of Heaven where we enjoy the rights and privileges of our new homeland right here and now. We are ambassadors of this heavenly kingdom, and God works in us and through us to bring heaven’s work to earth in every step we take. The enemy knows that when we know who we really are…we will be unstoppable. Satan is well aware that God has defeated him. But if he can trick you into believing that you’re the loser, then he’s won a small battle. And to keep winning, all he has to do is keep you focused on who you aren’t. If insecurity is masking your true identity in Christ, then ask God to show you where your thoughts have gotten tangled in a lie. He will lift you out of that pit, one truth at a time. One recent Saturday morning, I went about my business trying to hold the whole world in my hands (as I sometimes do), and I was a little stressed out (as I sometimes am). The day’s calendar was bulging at the seams, and I had kicked it off in sort of a grumpy mood. It was in that sour attitude that I hustled through the house and observed its contents through an Angry Mom lens. Apparently a sporting goods store had just blown up in the middle of the living room; there was a layer of dust covering the coffee table; and animal hair (so help me, God) had gathered in each corner and doorway within my line of sight. This didn’t exactly have a positive affect on my state of mind. According to my perspective, there was nothing good or satisfactory between these walls. In fact, everything was just all wrong. But then smack in the middle of my internal grumbling, I recalled a day earlier in the week when I viewed the exact same scene through a happier (rosy-like) lens. On that day, the clutter didn’t choke me. The dust bunnies didn’t throw me into a tailspin; and the baseballs and cleats strewn across the wild blue yonder didn’t gnarl my nerves. The game room curtains didn’t rent any space in my head. I didn’t even threaten to kill the cats because of their exasperating propensity to shed. It occurred to me that I had prayerfully begun that particular day, and had determined to live with a non-emergency attitude. 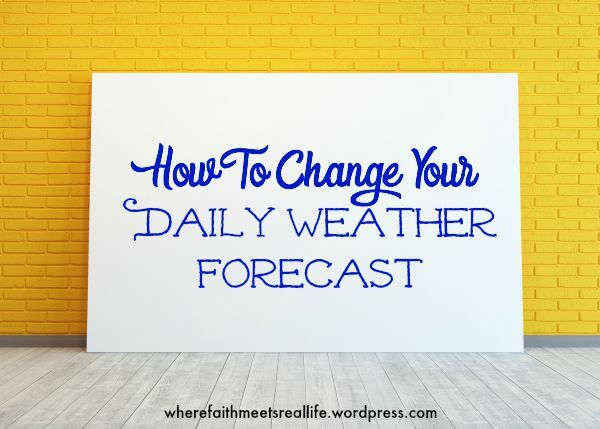 My mind was bent towards grateful instead of grabby, and since I had acknowledged from the get-go that God was in charge, I was able to maneuver unwelcome setbacks with grace. Tasks were purposefully performed one at a time, and I deliberately paused to take a breath before reacting to various hiccups. I was miraculously calm inside and out, and outside circumstances didn’t have permission to toss me back and forth. One day I’m all Cloudy With a 98% Chance of Tornadoes, and the next, I’m Miss Sunny With a Cool Breeze & Fluffy-White Clouds. The only variable factor present is my mindset. Which sort of means that I can change the weather just by changing my thoughts. A non-emergency attitude is only possible (for me) when I set my perspective on truth (beyond how I might feel), and intentionally humble myself before the One who (really) runs the world. On the other hand, a “me-centered” perspective sees other people and situations as they relate in orbit around the ego-centered universe. Everything teeters or totters according to how it fits with my personal plans and expectations. So what does your own view look like today? Do you see things through heaven’s reality, or your personal worldview? Is it all hazy in your head with a major chance of storms, or are the skies all clear? If you catch yourself wallowing in negativity, remember that you don’t have to change a single thing around you to experience a completely different scene. You just have to change how you look at it. I took a walk the other day. Which is not breaking news material, but just roll with it and hope that I actually have a point to this excitement. First of all, a leisurely walk doesn’t quite fit into my category of Favorite Things To Do. I would rather run and get finished much faster. Anyhow. On Thursday morning last week, I grabbed my shoes and my phone; and stepped outside to call Ruthann (my mentor), who would lead me on this meditation walk over the phone. S t e p a–n–d P l a c e.
I could already tell this would be a riveting half hour it we kept up this slo-mo pace. My mind moved at a much faster clip than my feet: Is this a joke? I look like a moron. Please God don’t let anyone look out their window right now. It was just awkward, y’all. After 3-4 minutes of fumbling through the rhythmic pauses with my slow motion feet, Ruthann read Psalm 23 to me. She read each phrase deliberately and paused between each one so that my mind had time to soak in the words. That part was all great. The only problem was that we were now about 7 minutes into this meditative walk, and we had 23 to go. What in the world?! I had a laundry list of things to accomplish, and for crying out loud, I had no business taking a walk at 8:30am on a weekday morning. My brain was screaming at me: You don’t have time for this. Don’t you know that success skips over weekday morning walkers? Who does this? Retirees, that’s who. And monks. And last time I checked you were neither. You have Greek to learn, a kitchen project to clean, and a guest post to write by next week. I just don’t know, y’all. I’m beginning to think living slow is key to abiding in Christ. When I really stop to think about it, I rarely discern God’s guidance when I’m hustling to the next thing and the next at lightning speed. Many days are like a sprint, and even when my calendar isn’t crammed from start to finish, I fret over what I should be doing to maximize the time. If I don’t get still enough to sit before Him and just listen, how do I even know whether it’s His voice or my own directing all the traffic in my head? Often, Jesus is sort of like a carpool partner. Once it’s time to get my day rolling, I drop Him off so that I can focus on all the things that are important. What good does all our hurry do if we miss Jesus in the madness? I’m not suggesting we go all pioneer days and ditch our Cozi calendars and iPhones altogether. But I am saying that scripture doesn’t portray a hustling, stressed out Jesus. If we truly aim to be more like Him…we might do well to slow our roll…and pay attention to the Right Now. A rhythm adjustment might jar us at first, sort of like awkwardly pausing between each step. And our neighbors might look out the window and think we’re weird. 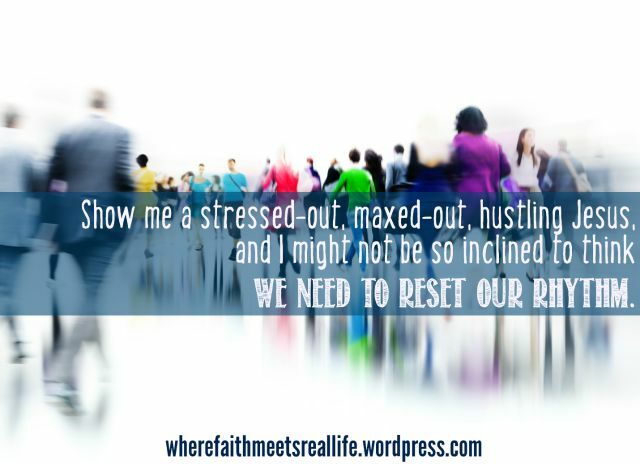 But if keeping up the culture’s stressy-rushy pace means we’re too busy “accomplishing” All The Things to notice how God shows up all around us, then perhaps it’s time to reset our rhythm to the original factory settings. After all, we were made for the holy, not the hurry. What does your hurry look like? How does it feel? What does it look like to slow down? What does that feel like? Here’s one way to be certain God is inviting you to deal with a particular issue: if you repeatedly notice A Thing while you’re minding your own business – and then BAM, your pastor drops That Thing in your lap on Sunday morning like a laser-aimed bomb. A long time ago (or maybe within the last two years), I had a stress thing that grew into a anxiety thing. Which gradually grew into a headache thing, coupled with crazy knots in my shoulders. So I loaded up on daily doses of tension with no consideration of how it affected my body. My Dad often told me that I needed to slow down; and Larry regularly advised that I bring the uptight down a notch or thirty. It only took me way too long to recognize that a mind and body wasted by stress is not part of God’s plan or purpose for me. How long will I sacrifice Real Life for the facade of an Okay Life? How long would I believe that chasing money, status, and comfort at a killer pace was the Good Life? You and I were handmade by God to LIVE. He uniquely shaped us on purpose, for a purpose; yet stress throws our shape all out of whack, and keeps us from truly living the life God dreamed up for us. Note: I did not say, “Life is rosy, so just quit stressing out already.” Rather, let’s learn to channel our stress in a healthy way. (1) 3 minute breath breaks: Start with 2 of these per day. Look at your schedule and choose 2 specific times in the day where you can spare 3 minutes. These breath breaks can take place at your desk, in your car, on the elevator. You can even hide in the bathroom if motherhood deems that the best option. During this time, just sit and breathe. Set a reminder on your phone for those times, sit down, and focus on your breath. I’ve mentioned this breath stuff at least 53 times on this blog. And frankly, if I consistently mention anything for any length of time, you can bet it’s significant. (3) Journaling: Don’t get twitchy as though I’m suggesting you go all Dear Diary or something. Where did I experience God at work in and around me today? 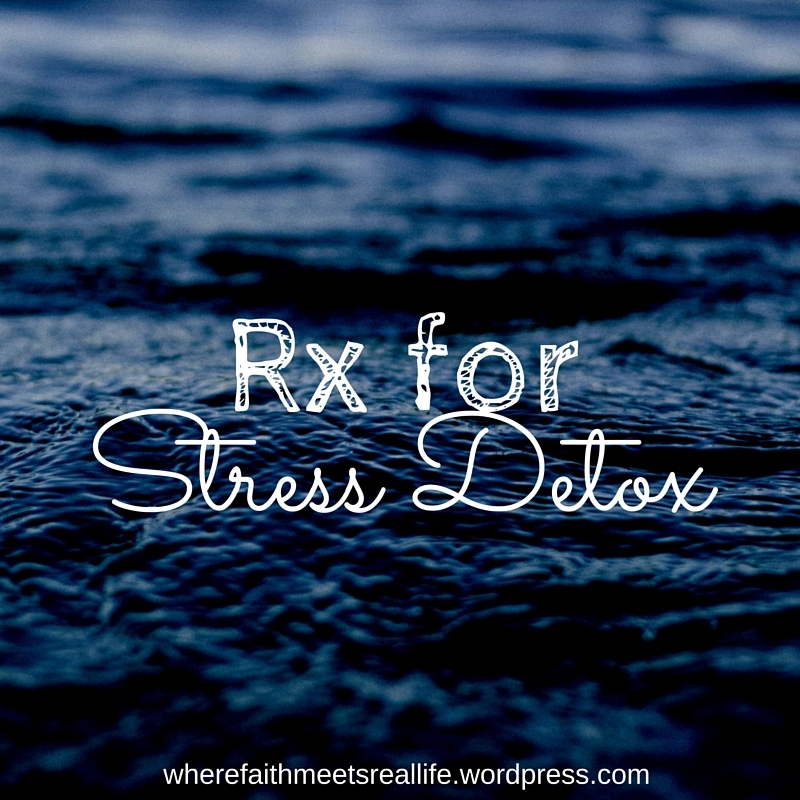 God’s purpose for your life is worth a stress detox. So what are you going to do about it?